When it comes to platforms for trading binary options, there are plenty of choices available. In fact, the choices can sometimes be overwhelming. There are so many platforms available because this is a sector that has been growing for several years now. Unfortunately, it is not a sector where all of the players are honest though. The reality is that it is full of scams and fraudulent platforms, apps and websites designed to entice you in and get your hard-earned money. We look at as many binary options trading platforms as possible to help you make the right decision. In this article, we review Profits Unlimited. Profits Unlimited is a platform for trading binary options. It was developed by Larry Landers and has generated a bit of stir despite being quite new. You can use it to trade binary options manually, or you can set the binary options robot to make the trades automatically. The binary options you can trade on include forex, commodities, and indices. There are a number of different trades you can make, including trades on 60-second binary options. How Does Profits Unlimited Work, and What Does It Cost? The initial required deposit is $250. Once you sign up, you have to connect with a binary options broker, but the app walks you through this process. It offers a live trading signals feature, plus there are a number of guides and eBooks available if you are new to trading and/or binary options. There is also a live chat facility available if you have questions or need to contact customer support. Profits Unlimited claims that traders can make money within a day, even if they are new to binary options trading. In general, the claims are fairly realistic though. For example, you won’t find any promises that you will earn millions. In terms of actual numbers, when you make a correct trading decision (or the bot makes it for you), your returns will be 70 percent. So if the trade is $100, your potential profit is $70. Profits Unlimited appears to do a number of things right. For a start, it has a realistic pitch rather than pretending it can make you rich overnight. Also, it seems genuinely interested in educating its users, particularly those who are new to trading binary options. The biggest problem with the platform, however, is one that we see with a lot in new trading platforms: a lack of a license or formal approval. That does not automatically make it a scam, but we have a policy of only recommending licensed platforms. One other thing that concerned us with Profits Unlimited is the lack of customer feedback. Genuine platforms usually have positive feedback from satisfied customers both on their own websites and on third-party sites. Unusually, we could not find this in relation to Profits Unlimited. Conclusion: Should You Use Profits Unlimited? While we found nothing to indicate that Profits Unlimited is a scam, it is a platform we cannot recommend. This view could change if we get new information, such as the presence of a license for the platform, or genuine and verifiable customer feedback. Until we have that information our advice is to choose a different system, preferably one that has a license. 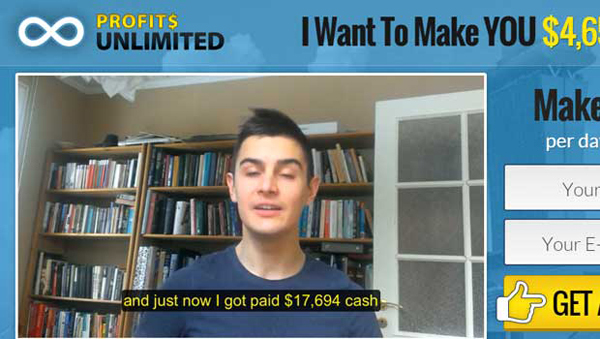 7 Binary Options review: Profits Unlimited: 1 stars. Anyone tried this or is it a scam? It is scam. Try Option Robot instead. Anything I should try instead? Why do these scams always hire such bad actors? Can it be any more obvious? !